Title: 08/07/1989 - Hazard Communication Standard (HCS) Material Safety Data Sheet Requirements for the Construction Industry. SUBJECT: Hazard Communication Standard (HCS) Material Safety Data Sheet Requirements for the Construction Industry. This is in response to your memorandum of May 26, requesting an interpretation of the HCS material safety data sheet (MSDS) requirements as it applies to the construction industry. MSDSs are required to be maintained at the jobsite. The basis for this interpretation is the HCS definition of workplace which means "establishment, jobsite, or project, at one geographical location containing one or more work areas." The MSDSs must be on the jobsite and readily accessible to employees when they are in their work areas during the workshift. Alternatives, to actual paper copies of MSDSs, which provide readable copy on-site are permitted to meet this requirement this requirement. For example, computer terminals or FAX machines which allow employees to read and refer to the MSDS are permitted to be maintained at the jobsite, in lieu of paper copies, as long as no barriers to access exist. There are no minimum time requirements for determining whether MSDSs maintained at the jobsite are readily accessible to employees while they are in their work areas. To make this determination compliance officers must ascertain whether a barrier to access exists. For example, must employees ask a supervisor or other management representative for the MSDS; are the sheets or alternative methods maintained at a location and under conditions where employees can refer to them during each workshift, when they are in their work areas; if a computer or FAX system is used, do employees know how to operate and obtain information from the system? Employees must have access to the MSDSs and be able to get the information when they need it. This may be accomplished in many ways and requires the compliance officer to exercise professional judgment in evaluating the accessibility of the MSDSs on-site. On multi-employer jobsites, employers who produce, use or store hazardous chemicals, must provide copies of MSDSs to the employers of other employees exposed to the hazardous chemicals, or make them available at a central location at the jobsite. Again, actual paper copies of data sheets, computer terminal access, or other means of providing readable copy on-site are permitted. Take your MSDS's on your laptop with this 400,000+ MSDS database from Safety Emporium. 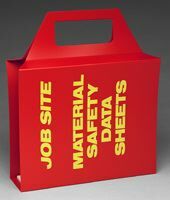 This portable job site MSDS binder from Safety Emporium is another way to comply with OSHA multi-employer workplace regulations.